Guided Practices for Reclaiming Your Body and Your Life. Guided Practices for Reclaiming Your Body and Your Life Mindfulness can transform pain. Over the past three decades, Jon Kabat-Zinn has clinically proven it. Now, with Mindfulness Meditation for Pain Relief, the man who brought mindfulness into mainstream medicine presents for the first time on audio his original practices for using conscious awareness to free us from physical and emotional suffering. This long-awaited two-CD program begins with an overview of how mindfulness changes the way our bodies process pain and stress. Listeners will learn tips and techniques for working with the mind and embracing whatever arises in our lives, however challenging. 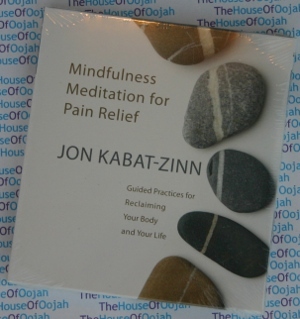 Then Jon Kabat-Zinn leads us in guided meditations drawn from his pioneering Mindfulness-Based Stress Reduction (MBSR) methodology to help us work with and find relief from chronic pain, everyday stress, and emotional challenges, as well as to read and act appropriately in the face of acute pain. "Mindfulness can reveal what is deepest and best in ourselves and bring it to life in very practical and imaginative ways--just when we need it the most," explains Jon Kabat-Zinn. Mindfulness Meditation for Pain Relief gives us a ready tool for overcoming even the most extraordinary difficulties. He is a board member of the Mind and Life Institute, a group that organizes dialogues between the Dalai Lama and Western scientists to promote deeper understanding of different ways of knowing and probing the nature of mind, emotions, and reality.